Accurately predicting unknown quality-of-service (QoS) data based on historical QoS records is vital in web service recommendation or selection. Recently, latent factor (LF) model has been widely and successfully applied to QoS prediction because it is accurate and scalable under many circumstances. Hence, state-of-the-art methods in QoS prediction are primarily based on LF. They improve the basic LF-based models by identifying the neighborhoods of QoS data based on some additional geographical information. However, the additional geographical information may be difficult to collect in considering information security, identity privacy, and commercial interests in real-world applications. Besides, they ignore the reliability of QoS data while unreliable ones are often mixed in. 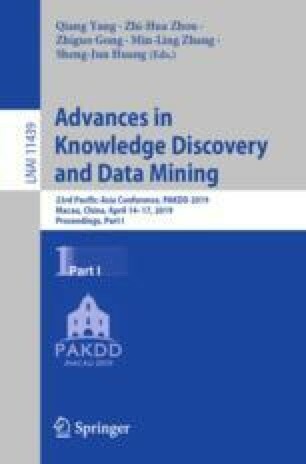 To address these issues, this paper proposes a data-aware latent factor (DALF) model to achieve highly accurate QoS prediction, where ‘data-aware’ means DALF can easily implement the predictions according to the characteristics of QoS data. The main idea is to incorporate a density peaks based clustering method into an LF model to discover the neighborhoods and unreliable ones of QoS data. Experimental results on two benchmark real-world web service QoS datasets demonstrate that DALF has better performance than the state-of-the-art models. This work was supported in part by the National Key Research and Development Program of China under Grant 2016YFB1000900, and in part by the National Natural Science Foundation of China under Grants 61702475, 91646114 and 61772096.